Note: If you purchased MLB At Bat 11 during the season, be sure you update the app to get the additional postseason features. Postseason.tv is essentially meant to be used as a supplement to the regular TBS broadcast, so you won’t get the same dynamic camera views of the TV broadcast. What you get is 10 different camera views to choose from, or a 4-in-1 mosaic view. 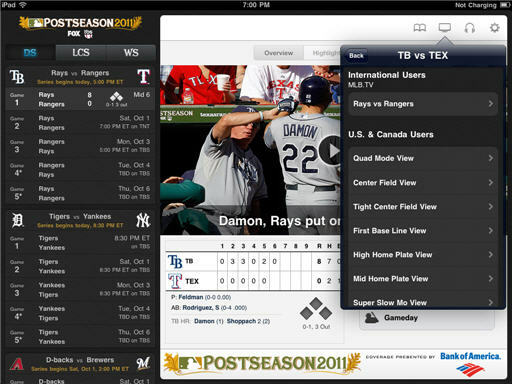 You access Postseason.tv from the top menu. You can also listen to the live audio stream if you prefer. (International users get access to the full broadcast via MLB.TV) Next selct one of the camera viewa. Double tap the screen to pull up or hide the stats, lineup, roster, etc. Select the little TV icon at the top right to switch viewing modes. One annoying feature of the app is that is re-verifying your access every time you switch cameras views. So, I tended to keep it on one view for the entire inning. The Mid Home Plate view and High Home Plate view (pictured below) seem to make the best viewing options if you are using it as a standalone way to watch the game. These cameras will pan left and right to capture the action during the play, but many of the other cameras are stationary. 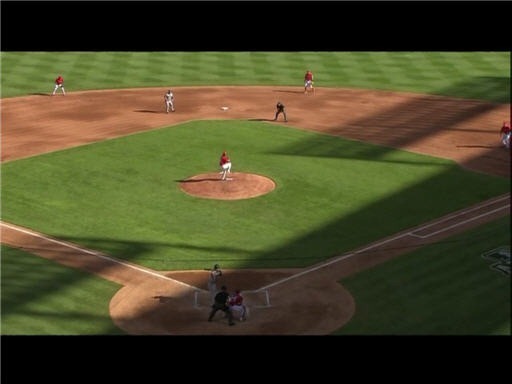 I found watching Postseason.tv on the iPad to be a surprising decent way to watch a game. It’s not the same as watching on a large screen high def TV of course, but it’s definitely an acceptable alternative if you can’t be in front of your TV. Or, if you don’t get TBS at home. 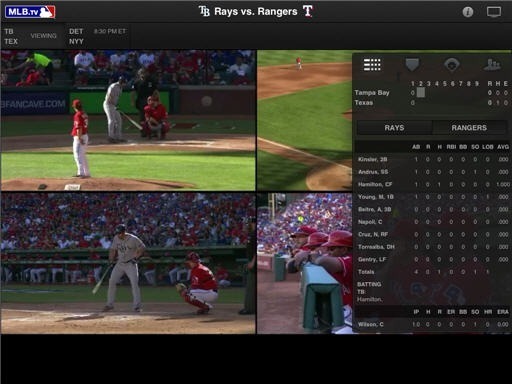 While watching the Rays and Rangers I spent the most time watching with the High Home Plate camera, but I also found the mosaic view (4 camera views on one screen) to be a pretty interesting way to view a game. Last season I had some issues with the cameras being out of sync in the mosaic view, but had none of those problems so far. Everything was in sync and made for a solid viewing experience. My one complaint is the inability to actually choose your camera angles in the mosaic view. For the Rays & Rangers, we were a presented with a view from behind the pitcher, a side view of the batter, and view from behind home plate. The fourth camera was pointed into the Texas dugout and generally right at Ron Washington. While that camera can provide some interesting reaction shots, I likely would have preferred other views. UPDATE (10/1) : The Brewers – DBacks game has 2 dugout views (one for each team) in the mosaic view. You don’t see the replays. It’s live cameras the entire time. When the announcers are describing a replay, you are still looking at live shots of the field. Even if you have TBS and plan on watching every game from the comfort of your couch, Postseason.tv still makes a nice a supplemental viewing tool, especially on the iPad. I don’t know that I would buy the app for iPhone or Android at this point unless that was my only way to watch the games. The iPad app, however, is probably worth it to serious baseball fans simply as a supplement even when watching every game on TV.